Team 140 better known to us as `Devon`s Best`, comprising of our very own Rob Lingard and his trustee co-pilot and mechanical wizard Adam Rhodes, joined over 130 other classic Triumph vehicles leaving Knebworth House on 5th October in the Round Britain Reliability Run. 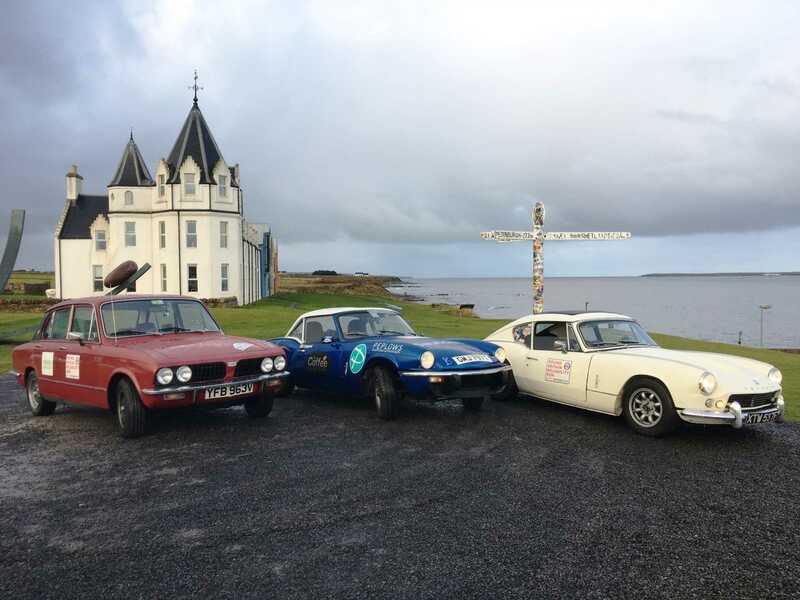 Organised by Club Triumph the challenge is a 2,000 mile route around mainland Britain in 48 hours (stopping only for fuel and short rest breaks), which all sounds easy enough until you try it in a 39 yr. old Triumph Spitfire! Starting at 18.00hrs the first gruelling leg was to be an 11 hour drive up the East Coast to arrive at John O`Groats at the tip of Scotland by 07.00hrs the next morning. On Saturday the teams enjoyed arguably the best driving roads as they tracked back through Scotland, passing Ben Nevis, Loch Ness and the Pass of Glencoe, with breath-taking views along the way, before crossing back briefly into England. Saturday night brought wonderful night driving, for our intrepid duo, through Wales (and they even got lost!) before crossing the Severn Bridge back into England in the very early hours of Sunday morning. Now back on familiar West Country roads, their breakfast stop saw them at Lands End about 07.00hrs on Sunday, watching the sunrise over the Cornish landscape. Returning through Devon, they stopped at Badgers Holt on Dartmoor (cheered on by friends and family) before setting off to Dorset, and north to Oxford, to the finish line at Knebworth House where the boys enjoyed a very well earned pint, or two! Rob and Adam travelled approximately 2,400 miles in a 39 yr. old car which apart from some upgraded MX5 sports seats and rally Halogen headlights, is still the original engine, running gear and suspension. Devon`s Best drove incredibly well, and we are all so proud of her (it really is a tough adventure on any car, and about 28 cars failed to complete the run!). As a team `Devon`s Best` has raised nearly £1,000 and the current total for the Club is just over £72,000 which is in aid of Epilepsy Research UK, a charity very close to our hearts and what incredible work they do! There is still time to make a donation via www.justgiving.com/fundraising/rob-lingard2 and we are thankful for our very generous supporters and sponsors again this year, along with the organising crew and all the marshals that helped out and kept the lads going at each check point.